love the colours simple & beautiful. 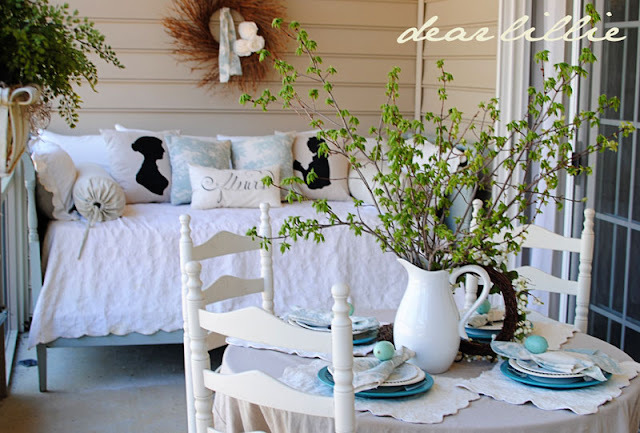 I love the way you have styled the table it looks very pretty & that seating area looks lush, I love the pillows. Ok, I have some serious porch envy! I love both color variations of the Jane Austin pillows, and now I'll be on the lookout for some pale blue plates for you! Looks beautiful! My porch is so green with pollen, that I am afraid to do anything yet. It requires a daily bath just to sit out there. When you find the plates you like please send me the peacock ones. I think they are wonderful! You porch looks great! I really need to work on my outdoor spaces. I'm so busy working on the inside that the outside looks like a ghetto. Do you ever get tired of being so fabulous all the time? 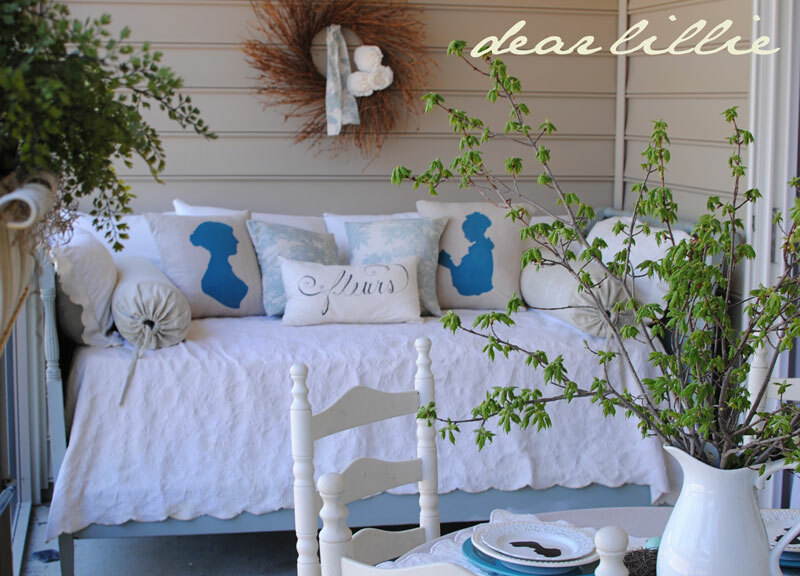 Jennifer, love your porch and all those wonderful pillows. Great colors on the table. Thanks so much for sharing Leila's photos that you edited. I can't wait to get some framed. Your porch looks fabulous. Do you happen to know the pattern name and/or mfr. of your toile fabric? Good luck with the birth of your new little bundle of joy! 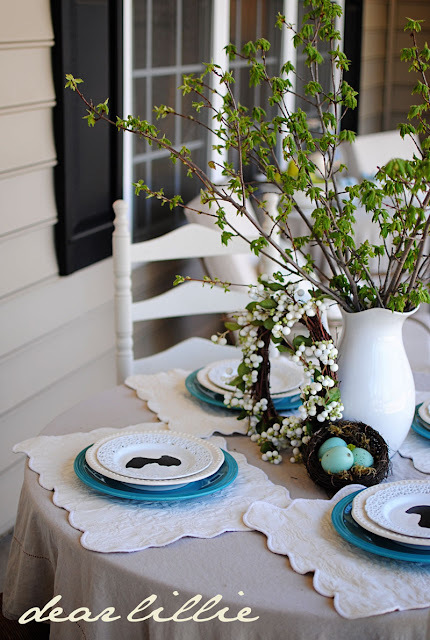 I actually love the teal plates but FYI...I have seen some really pretty blue plates at the Dollar Tree...not too bright and not too washed out. For a $1.00 each, you can't go wrong! totally jealous!! i wish i had a porch to decorate!! 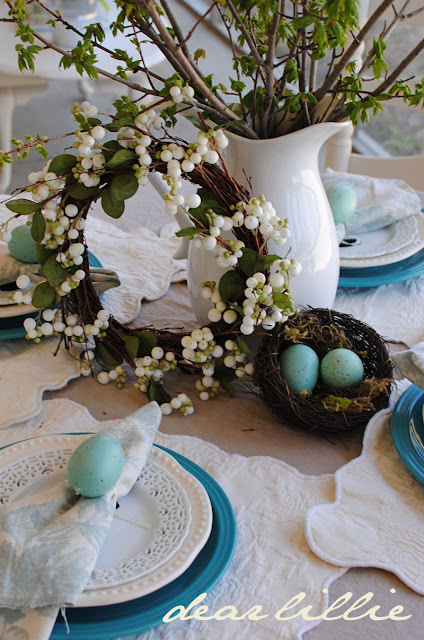 i love the teal blue plates i think with the white plates on top it takes away from the color more! but then again i love bright colors for spring and summer! our playroom is actually that bright teal blue color if that says anything! lol i love how you decorate i wish i was that talented! 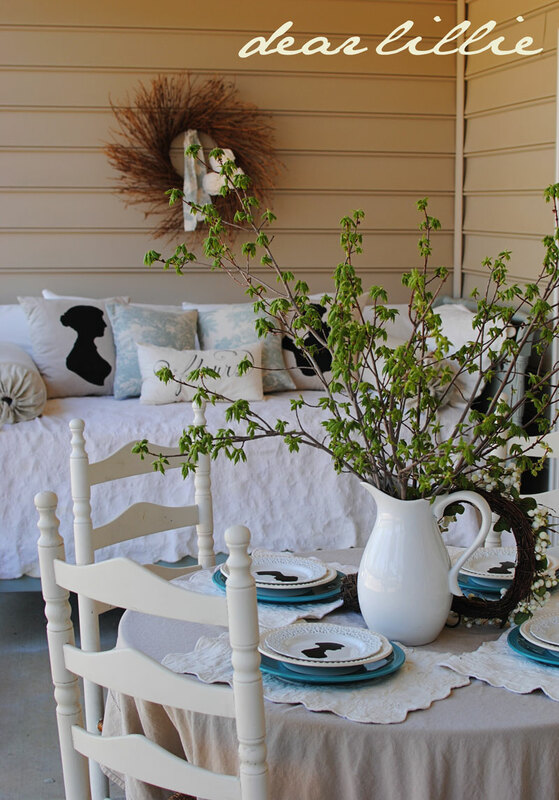 Love love love your porch. You have given me just the push I needed to get my patio spruced up. You have such talent!! Beautiful! Just a thought....I know you couldn't eat off of them...but could you spray paint the teal plates a pale blue? It would save $$ but give you the color you want for decorating. I am just loving your Spring porch, Jennifer! It looks amazing, as always and just like the rest of your decor! I adore the teal plates and think they add the perfect amount of pop, but i know how it is when you have that "idea" worked up in your head of the final look. 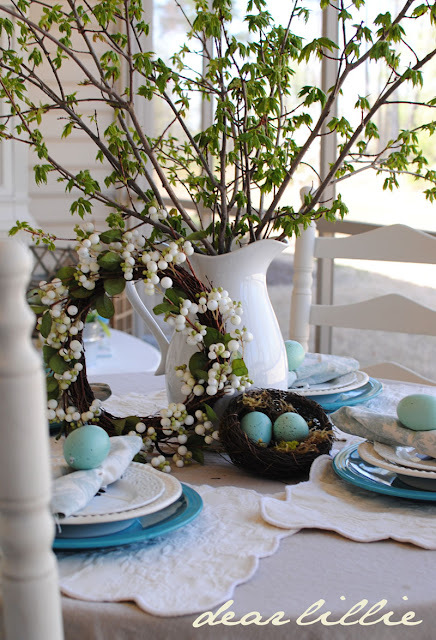 I can't wait too see more of your Spring/Easter decor...and of course that sweet baby girl when she arrives. Hope you're doing great! Jennifer... you do know your porch is prettier than my living room, right? i mean, shoot, i'd eat out there very night too. :) i'm adding "big ol' screened in porch" to the must-have list for our next home. ha. as for the teal plates... if you still have the box they came in, Target can look up your purchase with whatever credit/debit card you used. does anyone use cash anymore? lol. so unless you did, you can return the teal plates and get some pretty pale blue ones for half the price at dollar tree like someone else mentioned above. :) win. win. I love how you did your porch it's beautiful. 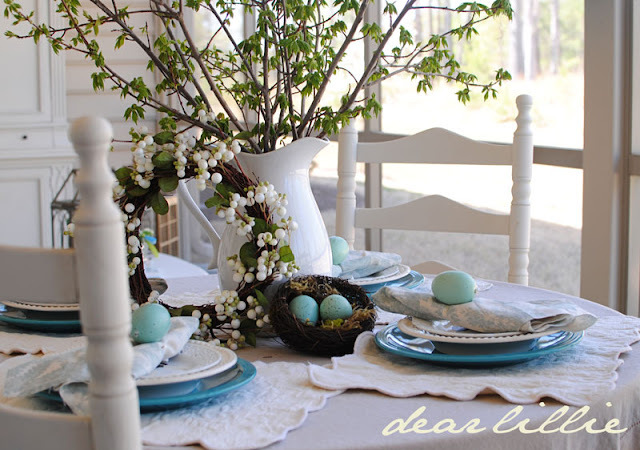 And I love the teal plates I think it gives it a nice pop of spring color. Love your fleurs pillow... hope to see a closeup of that! Or better yet, you could off er for sale, grin! 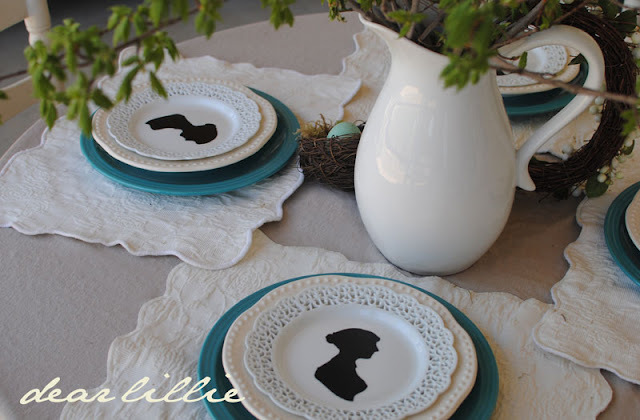 Love the pillows with the black silhouettes, they look way better than the blue ones, and those lacy plates, to die for. Beautiful. Your porch is gorgeous! 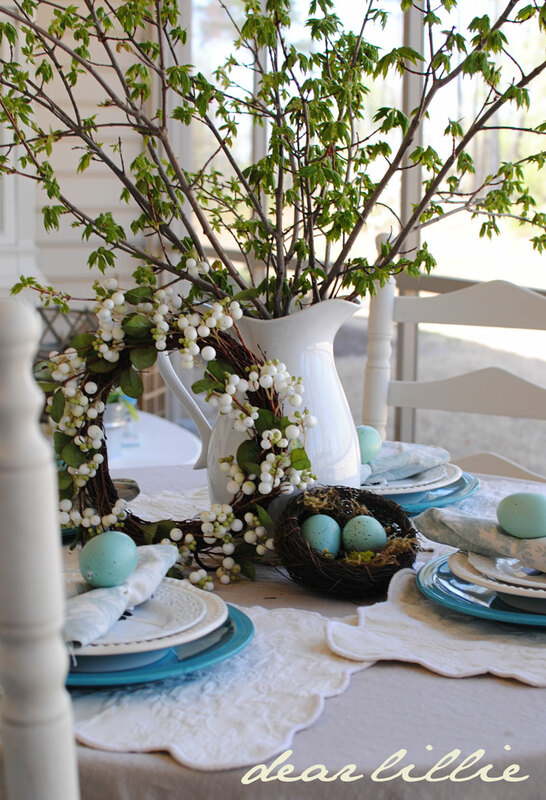 Lovin' the pitcher, lovin' the daybed and table, lovin the egg napkin rings...I love it all!! I love it! You have a beautiful decorating style! I absolutely love it. I am starting a porch redo myself but, due to our miserable Oregon weather, I am on hold. I'm jealous that you are actually already eating outside. However, your porch (for that matter ... entire house) is so gorgeous. It invites a person to come and sit for awhile. I am so loving your porch, I can see why you eat out there every evening! It is really too cold here to do anything fun like that yet. The daybed looks so comfy and inviting! 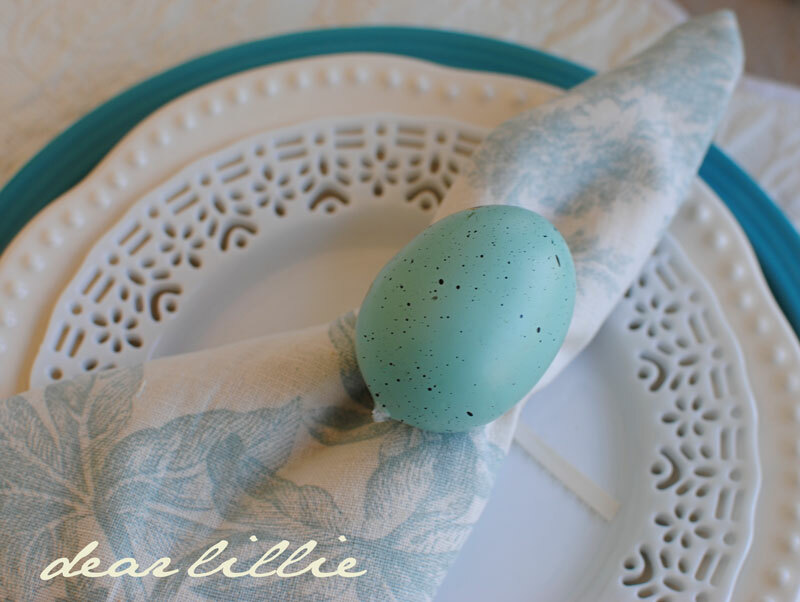 I like the teal plates but you have layered everything so nicely, it's just a small pop of color. 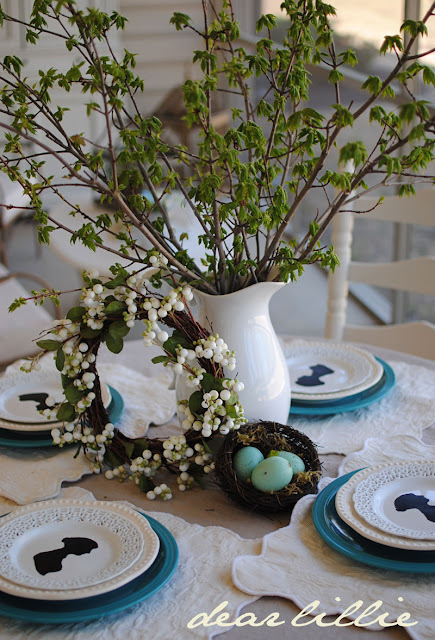 Your table looks so sweet, I love the nakins with the ribbon and egg and I really like your quilted place mats. Everything is lovely, Jennifer! Thanks for a great post, I am a new follower. Oh, I saw the pictures of Kim's granddaughter on her blog earlier this week. You did a great job and that baby is adorable! It looks so beautiful! I love the pops of blue. I have been searching for the last couple weeks for robins egg blue dinner plates but to no avail either. I do like your teal and love how you've layered them with the pretty doily plates. Your porch is wonderful. What a pleasant place to dine and relax! I'm excited for your little bundle to arrive! I bet Lillie is very excited. How gorgeous Jennifer! I bet y'all are loving dining outdoors! I think you've motivated me to clean up our back porch! And your photo editing is wonderful- those moms must be thrilled! hope that baby comes this weekend! i think i picked today for the big day!!!! fingers crossed, for your sake of course! I love your porch decor! 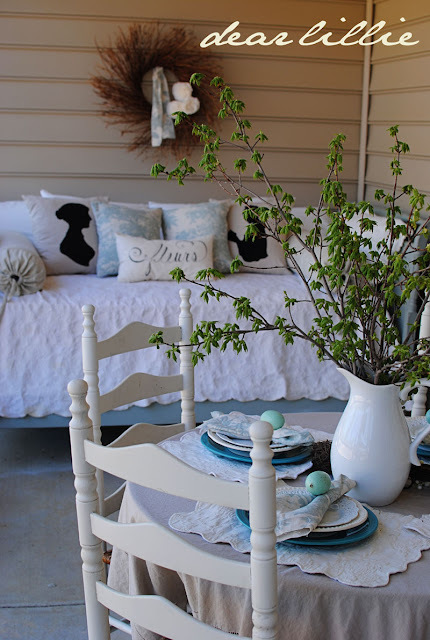 Looks like a relaxing place to stop and enjoy breakfast or lemonade or read a great book on the daybed. Everything looks so lovely on the porch, I love your colour scheme and your tablescape, it's photo-perfect! This is such a beautiful extension to your home. It has to be great to have a outdoor space like this for meals! Love all your special touches! Your porch looks beautiful! 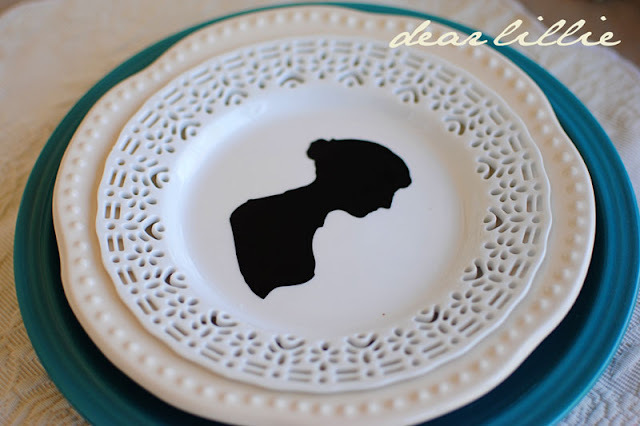 Have you ever tried spray painting plates? I have seen it done on people's blogs. If those plates are like a charger, where you would never want to eat off of them, that might work! Paint them your favorite light blue. Personally I think the pop of color looks very nice, but I get where you're coming from, too. I LOVE your decorating style. Your blog is just lovely! Your porch looks beautiful....I'm really liking the pop of bright blue with all the soft white...just right! FYI...I have returned items to Target after losing my receipt...they gave me a store credit rather than a cash refund. The photos you edited are precious! Wishing you a speedy delivery...and a happy healthy new baby girl! I'm your newest follower...can't wait to come back for another visit! Jennifer your porch looks beautiful. Oh how can picture sitting there listening to the birds and having a cup of tea. It is so charming. I love the blue plates by the way. I have just discovered your blog...must have been living under a rock, as someone said. 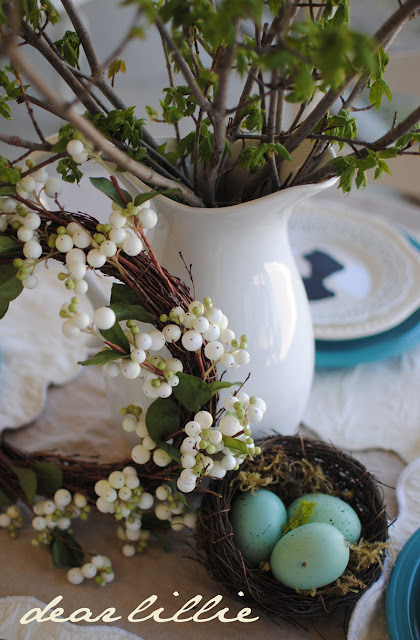 Such GORGEOUS photos & ideas! I am your newest follower & I'll be here looking through all you older posts for at least an hour more. Outstandingly beautiful!!! Seeing your gorgeous tablescape makes me yearn for spring. I woke up this morning to four inches of snow! The last time I checked, it was April, but that's Michigan. So glad you're having lovely weather. girl - don't know if it's an option for you or not, but if you paid with debit/credit at target, they can probably look up your plates & you can still return them...just a thought! 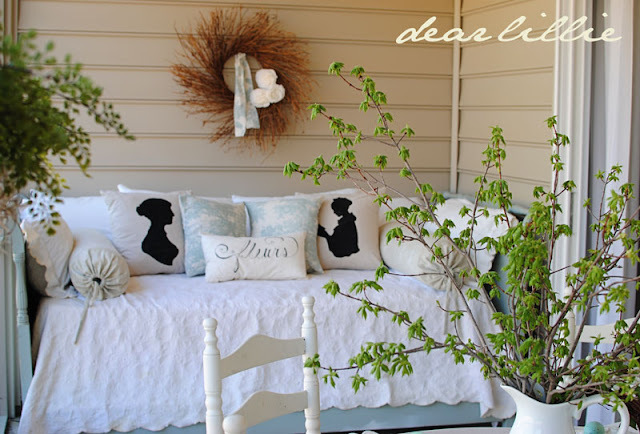 Hi Jennifer, I am in love with your porch! What a beautiful space you have created. I Love the blue and white color and the silhouettes are fabulous. I love your porch! 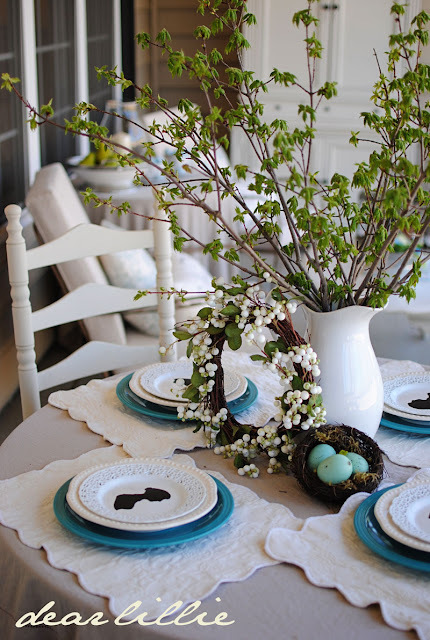 As far as those teal plates, I think they are the perfect pop of color with all the white. Oh, I have a daybed that I was planning to get rid of. Now, I am rethinking that! Don't let the teal plates bother you! I think they are great and not too overpowering at all! Hello, I'm brand new to the blog world. 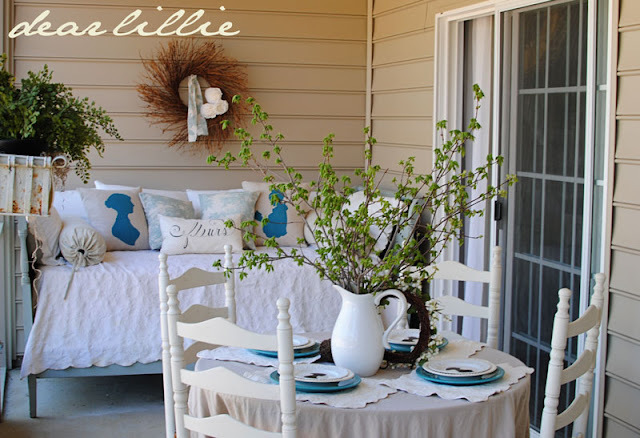 I stumbled across your site thru Addicted2Decorating (I think) Anyway, I absolutely love, love your porch. I also think the teal plates look great (and I haven't read all the comments) but why not just paint the plates the color you want?